The Bars & Stripes slots know what people think about when they are considering what makes America grand. Click here to play! It's not the incredible achievements of social or technological progress, nor the military might of the nation. No, it's all of the little things that make people proud to live in the Land of the Free. Things like apple pie and turkey on Thanksgiving. Or eating a hot dog with an ice-cold mug of beer while watching the football. It's little things that make up America, like eating a double stacked Oreo or getting a burger and fries on the way home from visiting friends. The Bars & Stripes slots remind you of what makes America such a great place to live. Featuring symbols of the everyday like hot dogs and beer, as well as the timeless symbols of America - Old Glory, the bald eagle and the Statue of Liberty - Bars & Stripes celebrates everything about being American. 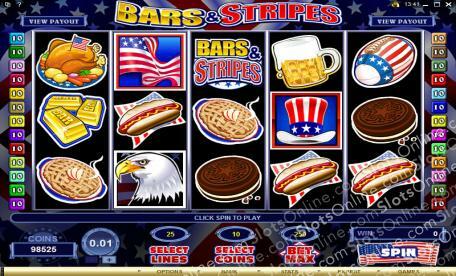 Stars & Stripes Pigskin symbols are scatter symbols and offer payouts on the total bet when 3 or more are scattered across any of the reels. 3 symbols win twice the bet, 4 symbols win 20 times the bet, and 5 symbols win 200 times the total bet. Also, Stars & Stripes Hat symbols trigger the bonus feature when 3 or more appear. Bars & Stripes symbols can substitute for anything other than scatter symbols. When three or more Stars & Stripes Hat symbols are scattered across the reels, players get to choose one of the hats and a special prize is revealed.